Check our Store for additional items and great savings. 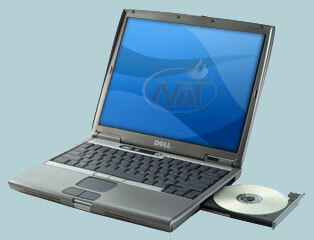 The Dell Latitude D600 is designed for users who require maximum performance in a mainstream notebook. With a thin, light design, the D600 is big on performance, offering the ideal blend of power and efficiency featuring a 1.6Ghz Intel® Pentium® M processor with 20GB hard driveand the ATI® Mobility Radeon 9000 video card. The D600's internal magnesium alloy frame provides structural rigidity to protect vital internal components, while the lightweight aluminum external shell provides outstanding protection and stylish appearance. The D600 features a 1.6Ghz Intel® Pentium® M processor incorporating a power-optimized 400MHz system bus designed for higher performance. The processor also features 2MB of cache, enhanced Intel SpeedStep® Technology and USB 2.0 support. Built-in wireless networking and gigabit-capable wired network card standard. Operating System Microsoft® Windows XP® Professional installed!!! This laptop is refurbished off lease. The laptop is tested and is in excellent working condition. All parts & Features are tested by our certified technicians and are guaranteed to work. Being refurbished the laptop may show signs of use such as minor scratches and dents, or other signs of cosmetic wear. Payment is due immediately upon winning an auction.Please note that we require 1 to 2 business days to process and ship your order after receiving payment.Item will ship via UPS Ground within the continental United States only. You will receive a UPS tracking number once the item is shipped. Paypal and Money orders (No International Money Orders only US). Please contact us for mailing instructions if paying by money order (877)392-0658. We use UPS Ground and only ship to the Continental US only. We only ship to paypal confirmed addresses. All Items have Shipping Insurance. This Insurance covers 100% of the cost of the shipped item in the event of loss or shipper mishandling. The insured package may or may not have insured print on it but it is covered. This Laptop comes with a 30 Day Warranty. We will repair the problem or do an even exchange if we can't fix the problem. There is no refund. This warranty does not cover Battery, Operating system, accidental or physical damages. All returns Must be within 3 days of item received. There will be a 20% restocking fee. We do not pay return shipping. Any S&H Fees are none refundable. The returned item must be in its original condition with all its accessories included. New America Technology is an Internet based shop whose mission is to supply a wide range of competitively priced quality-refurbished and new laptops and components to individual consumers and businesses at the lowest price possible and in a prompt and convenient way. You will get a great deal on our products, at a fraction of its original retail price. At New America Technology, we will not be undersold! Our products are of the best quality available and we stand behind the products we offer. We back them up with our warranties. We test every system before we ship them out of the facility by trained and skilled technicians. New America technology has strict policies to insure online safety. By using the leader for online security transactions, on every order processed you can be sure your information is safe and no personal information will ever be shared or sold. All credit card transactions are encrypted to ensure complete protection against fraud. If fraud is detected we notify everyone involved immediately. We understand that purchasing online can be a bit intimidating. Where do you start looking? Is the first place you find even the best one? Are there better deals at other stores? If you have any questions please feel free to call us. We are here to help. (877)-392-0658.